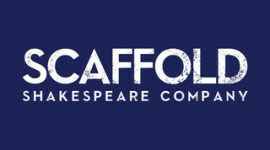 Scaffold Shakespeare Company create award-winning workshops and theatre productions. Founded in 2011 out of a shared desire to explore the classics, we believe theatre should be available for everyone, and we embrace the infinite possibilities of Shakespeare’s work. We stage vibrant collaborative productions to bring these stories to life for today’s audiences, creating shows for theatres and other performance spaces. Through regular workshops, we are committed to creating inclusive opportunities for Shakespeare enthusiasts and novices to discover their own relationship to Shakespeare, to find how his work still matters to them, to make it their own. Scaffold’s work to date has included a 3-year workshop project "The Complete Plays", and a site-specific production of Shakespeare’s Sonnets "Speak Low If You Speak Love" with Hampton Court Palace. In 2018 we launched a new series of workshops "Warring Love", and in 2019 we will be mounting productions for a UK-wide tour. Our work is rooted in the understanding that Shakespeare’s plays are full of variety and open to interpretation. Developed over several years of collaboration with more than 200 theatremakers, Scaffold’s unique approach recognises the importance of openness, multiple perspectives, and creating an inclusive, supportive space where theatremakers can be bold and unburdened by the weight of Shakespeare History.